One of the most overlooked pieces of golf gear is probably one of the most used by golfers. 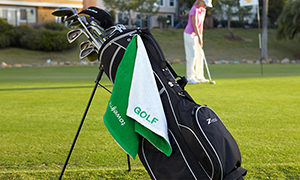 Golf towels are very common with seasoned golfers and novices alike. They’re versatile and can serve many great purposes on the course. While they’re not a requirement by any means, it’s not uncommon to see towels hanging off of a golfers bag or tucked in their pocket. They’re so commonly used that the USGA permits their use during play. There are a number of great towels on the market. 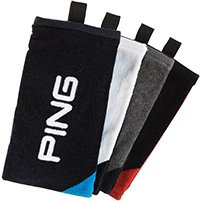 They’re specifically targeted towards golfers and often include a handy clip that ensures the towel is always within reach. These towels all range in size, design, and material. 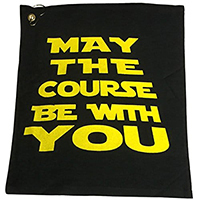 To help you on your search for the perfect towel that can serve you on the course, here are some of the best options available. This Tri-Fold towel from Ping is a versatile option that adapts to your needs. When it’s unfolded, it measures roughly 21 inches long by 16 inches wide. However, it folds down to 5 inches wide when folded to save you space. A simple carabiner clip is used to attach the towel to your bag. It’s connected to the towel via a strong webbing loop. The towel is made from 100% cotton for strength and comfort. It’s available in a handful of different color-blocked design schemes. With its unique blend of microfiber and cotton, this towel from Grip Boost is extra absorbent. When unfolded, the towel measures approximately 8 inches long by 10 inches wide. Half of the towel features a distinct checkered pattern. This pattern improves the towel’s cleaning capabilities. The varying textures can remove stubborn dirt and grime. There’s also a built-in pocket to make quick work of cleaning club faces or balls. The pocket can be wet or dry. The remaining parts of the towel will not be affected, allowing you to utilize different portions of the product to achieve different results. 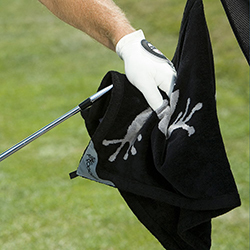 Add a bit of personal flair to your golf bag with a customized golf towel. This towel measures roughly 25 inches long by 16 inches wide. It’s available in a range of colors. Made from 100% cotton terry cloth, the towel is soft enough to be used on your face. 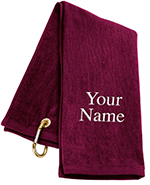 To make it your own, you have the opportunity to have your name or personal message stitched directly on the towel in a complementary color. The towel utilizes a strong carabiner as the clip. It’s held onto the towel with a matching grommet. 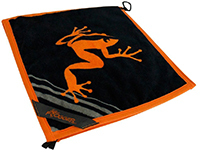 From the trusted brand Frogger is this unique two-in-one towel. The towel is quite large, measuring 24 inches long by 14 inches wide. The thing that sets this product apart is the pocket design. Essentially, the towel is made up of two separate towels stitched together to create a large pocket. Inside, the towel is made from 100% bamboo terry. The outside is made from cotton. The inside can hold up to triple the amount of water as cotton. As a result, you can make the inside wet to clean ear while keeping the outside dry. The towel utilizes strong webbing to create a loop that holds a durable carabiner clip. This package includes three separate microfiber towels. Each towel measures approximately 24 inches long by 15 inches wide. They come in three neutral colors so that you can easily distinguish which towel is used for what. Instead of a traditional clip system to attach the towels to your gear, these towels use snap attachments on one side. The towels simple fold in half and snap together so that they can be wrapped around clubs or other gear. If you need something a bit bigger, the separate units can be snapped together to create a single large towel. 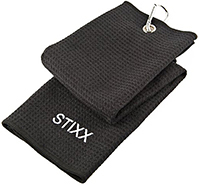 This simple towel from Stixx is designed to make cleaning your gear a breeze. It’s made from an absorbent microfiber material. The surface of the material is embroidered to have a waffle design. It provides a somewhat rough texture that can be used to get rid of stubborn dirt. The towel measures 21 inches long by 16 inches wide. It’s machine washable with mild detergent. Because it’s made from microfiber, the towel dries relatively quickly. A durable aluminum grommet is utilized on one end of the towel. It holds the aluminum carabiner for easy attachment to your golf bag. What Are Golf Towels Used For? Golf towels are used to complete a number of different tasks. They’re a versatile tool that can be beneficial to your overall comfort and performance. While they’re not used by everyone, many golfers mainly use golfers to keep their equipment dry and clean. Dirt on your club can greatly affect your performance. It’ll change the way the club makes contact with the ball during your swing, affect the ball’s overall trajectory, and weaken your power. While brushes are available to keep clubs clean, many golfers utilize towels because they’re easier to use and always on hand. With a bit of water, a golf towel can get rid of caked-on mud, dirt, moisture, and anything else on the club. Best of all, the process is quick and can be done after each shot if needed. The same goes for cleaning golf balls. Sometimes, it’s just easier and more effective to use a damp towel to clean balls rather than taking out a golf cleaner or locating a cleaner on the course. With a simple wipe of the towel, the ball will be free of mud and grime. Many golfers prefer this method to cleaning clubs and balls because towels can typically stay damp for extended periods of time. There’s also easier to use and can be hung on the bag for easy access. Another common use of towels is to stay dry. Whether it’s a hot summer day or just after a storm, there are many instances in which you’ll need to dry off your clubs or ball. If you’re playing in the morning, the golf course is likely covered in a light layer of dew. This water can affect your performance and damage your gear if left untreated. With a golf towel, you can wipe off the water your club has gathered after every swing. This will help to prevent rust. On hotter days, having a golf towel nearby to dry your hands can be a lifesaver. Sweaty palms will hinder your swing by making you lose grip of your club. Using the towel to wipe down your hands and club grip can help to ensure that environmental factors don’t affect your score. Dry wiping the sweat off your club can actually improve the stickiness of your club, allowing you to hold tight and swing with confidence. Having a few spare towels on hand for your own personal use is a great idea. You can use the towels to stay dry on a hot day. In addition to wiping down your hands, why not wipe the sweat off your brow so that you can focus better? Instead of worrying about sweat getting into your eye, you can focus on the game at hand. Some golfers even use towels as a way to stay cool on particularly hot days. Golf towels can be drenched in cool water and wrapped around your neck. This helps to regulate your core temperature and prevent sun fatigue. While you may be thinking that any towel will do, there are a few things that can separate good options from bad ones. You spend so much money on your gear, so why not invest in a high-quality towel as well? You’ll use these towels more than you think, so it’s a good idea to take time and consideration choosing the right ones. It’s recommended that you get towels in a few different sizes. Smaller towels can be used to clean golf balls while larger options are suited for keeping you dry. Furthermore, the weather conditions will dictate the size of towel you’ll need on any given day. To ensure that you’re prepared, try to get a range of sizes. The material can affect the overall comfort and effectiveness of the towel. The two most common materials for golf towels are cotton and microfiber. Cotton is popular because it’s soft on the skin. It’s typically used for personal use. Microfiber towels are a great option for cleaning and drying gear. The plush fabric attracts dirt. It’s also soft on your equipment and super absorbent. A high-quality clip that works with your needs will make using the towel more convenience. Traditional clips can attach to a variety of items. Whether it’s your golf bag or on the back of the golf cart, it should be easy to operate with one swift motion. Difficult clips that require extra steps to disengage are too much of a hassle. Swivel clips are also available. They don’t require you to unclip the towel. The towel stays attached to the clip and retracts to its original position when you’re done using it. While they may not seem like much, towels are a great addition to your golfing arsenal. They can help you keep your gear protected while improving your performance and comfort. With their versatile use, you’ll be using golf towels more than you thought you would. With great towels on hand, you’ll be better prepared to deal with whatever the golf course throws at you.